Two years after the release of the video showing Chicago Police Officer Jason Van Dyke shooting black teenager Laquan Mcdonald 16 times, his trial has begun. The community anger around this case shows the potential for mass protests to reemerge. In the weeks following the release of the video, city streets and Interstates were repeatedly blocked by massive crowds calling on Rahm Emanuel and State’s Attorney Anita Alvarez to resign. Emanuel’s reputation was irreparably damaged after the video was suppressed for months – with even establishment figures speaking openly of having no confidence in his ability to govern. Rahm has now announced that he will not run for Mayor again. There have been regular protests at the Cook County courthouse on trial days, but so far there have not been mass demonstrations demanding a conviction for killer cop Van Dyke. There’s an urgent need for such mass action to pressure the system to convict him. The courts are not immune to public pressure. A victory in this case could also ignite a new phase for BLM around the call to bring the police system under a public review board with the power to subpoena, investigate, hire, and fire. What is required is a mass movement, not only against police violence, but also against the generational poverty, unemployment, and community destruction that capitalism has inflicted on Black people. This movement needs to demand the support of labor unions. Black workers are the most highly unionized ethnic group in the U.S. and yet the needs of our communities are neglected by the Democrat-friendly policies of these worker-based organizations. We have seen that we can’t rely on Black – or any – Democrats to fight for what our community needs. Corporate politicians represent corporations first, no matter what their background, and the Black misleadership class in Congress has repeatedly voted for the militarization of the police. In Chicago’s Democratic Party establishment, all of the Black Caucus, and all but one of the Latino caucus, voted to build a $95 million police academy on the West Side of Chicago instead of investing that money in the community. This is in an area where the median household income is $22,351. We need to connect the attack on Black and Brown individuals to the system as a whole. The straining of resources in our communities points towards a larger struggle, and converging these movements means connecting the struggle to everyday working class demands: full community control and oversight over the police, fund education and youth job programs, demilitarize our schools, rent control, and housing justice for all! 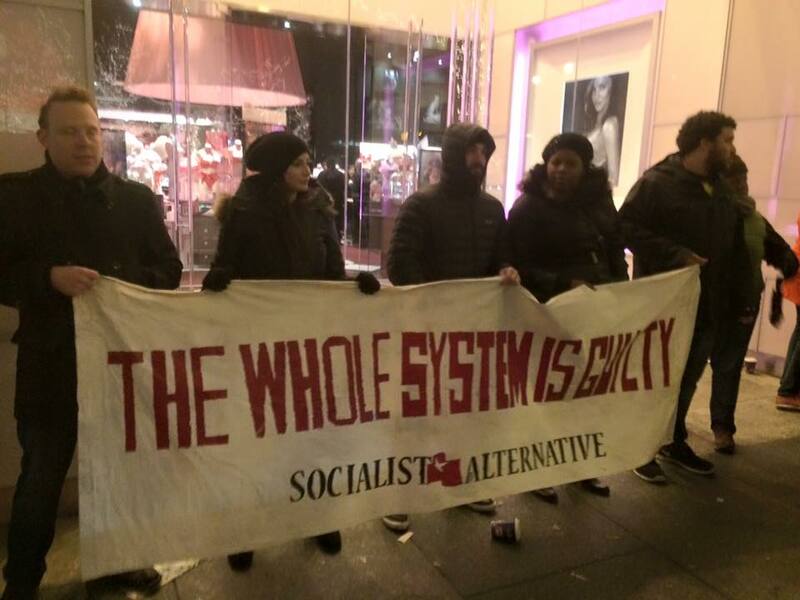 Socialist Alternative demands the conviction of Jason Van Dyke. But imprisoning one murdering cop is far from enough. This is not just a case of one rotten apple, but a tree rotten to its roots. If Officer Van Dyke is convicted, this will be a victory for those who fight against police brutality. We as working people should use that momentum to build a mass movement against police violence and racism, demanding elected community boards with the power to subpoena, investigate, hire, and fire the police. If he’s acquitted, we need to immediately organize mass action. We should make Black Friday the rallying point for mass protests to shut down profits, on the third anniversary of the shut down of the Magnificent Mile shopping district and call for major unions to join the actions with a one-day strike in solidarity. In the broadest sense, challenging the corporate political establishment that relies on racism means forging unity around a program to end police violence and poverty. This includes challenging the Black leaders who have colluded in keeping institutional racism intact through the war on drugs and mass incarceration. Behind the politicians stands the capitalist system itself, which has always used racism to keep working people divided and will never agree to end discrimination. This can only be accomplished by the multiracial working class fighting together for a socialist future. Convict and sentence killer cops. Create elected civilian boards with full powers over the police. Independent anti-racist candidates from community organizations and unions should run for these boards. End the policies which have led to mass incarceration of Black youth. Stop the militarization of the police! For the billions being spent on military-style weapons to be put toward schools, child care, health care, and other community services. For economic justice! For a $15 an hour minimum wage, guaranteed jobs for all. A massive investment in public education and transit paid for by taxes on the super-rich and corporations. End the cycle of capitalism that puts profits before the needs of working people.